I am really excited with the chance to finally explore WME and try making the 2D game demo. However, since I am still new to the engine and particularly scripting, I get stuck every now and then. Have got three questions and will try to explain them in a brief and clear way. 1. In "actors" folder created "sally" subfolder and copied files from "molly"
2. In "sally" subfolder renamed "molly.actor" to "sally.actor" and "molly.script" to "sally.script"
Also changed the subfolder name in "sally.actor" from "molly" to "sally" everywhere in animations (idle, walk, talk etc.). As you can see, the main actor (silhouette that is turned to the right) is there and she can move, alright. Sally, which is the silhouette that is facing us, is there too, and she doesn't move. However, there is a third actor that has Molly's graphics, is turned left and floats in the air. How do I get rid of her? What is wrong? My second question is - Can the floor (walking area) have only two vertices? Because I'd like actors to only move left and right in a staight line, without any depth, yet currently the main actor changes her track a bit within the walking zone (floor). This change of course is very slight, but still... not in a straight line. The third question is about actors again. I want them to talk with each other and move together to the right in a cutscene. How is it possible to create such cutscene animation? 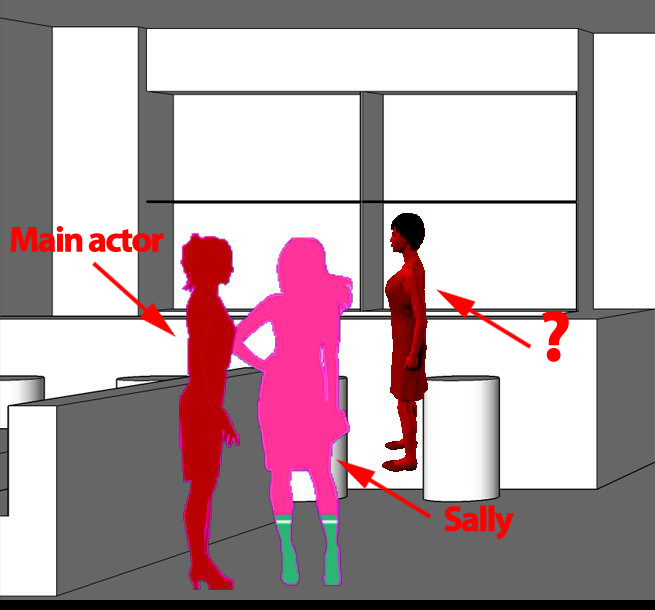 Sally, the second actor in the scene, does not move. Shall I make individual floor for her? Am I right? Please share your experience in this regard! P.S. The opportunity to make games is breathtaking. THANK YOU, Mnemonic! At least at the moment there is no any 3rd actor floating in the air. Just main actor and Sally. Regions must have at least three vertices. This is useful to keep in mind, but it doesn't answer my question, though... How do I get actors in the scene to move left and right in a straight line, without sliding up and down within the floor region? Could waypoints be the solution? And #3 remains as something I am currently not able to find solution for. How exactly is it possible to create a cutscene as in-built sequence in the scene? Like two characters talk and then Sally walks to the right and main actor follows her. Big Thanks to anyone, who finds time and knowledge to help me! You have created walking regions. Maybe you have noticed that you can also create a block region (just create a region and in the options set it as Blocked). Perhaps you can create your walking region and set it up around the floor and then create two very thin horizontal blocking regions around the area you want your actor to move. I guess the area must be very small to completely avoid the actor going up and down. I am not sure whether you can achieve this with waypoints. There is not eaxctly a built-in cut-scene mechanism in Wintermute, because a cut-scene, if it is not a video, is just commands executed in sequence with the user having no control. What I mean is that you can simply code your cut-scene any way you want. to give back control to the user. Hearty THANKS to you for your attention and friendly advice! I have created two horizontal blocking regions around the area the actor moves. It took some fine-tuning, yet in the end the actor could walk in more or less straight line. You were right about the move area being pretty narrow. I think this part is solved now. Also how do I set speed of replies (time between actors' sentences)? Game.Interactive = false; // We remove the control from the user. Sleep(3000); // Wait for three seconds before Sally says her line. sally.Talk("Have you ever played billiard? "); //Sally asks her question. //Here my corrections to the scene end. It seems, with your help, steps 1 - 3 are achieved. But I don't know yet how do I get other 4 steps working... Since one animation changes another, my guess was PlayAnimAsync() should be applied... Am I right? Should I use following script here? Can it be achieved with simple GoToObject? Step 7) The screen scrolls further to the right and we see Actor 4. He replies Actor 3, and the screen returns to previous position, hiding Actor 4 and showing main actor, Sally and Actor 3. THANK YOU for your help, anarchist! OK, when we tested the scene, it didn’t scroll, right? Let’s fix it. And make sure you follow the rules of scrolling, which is setting the main layer dimensions to be larger than the game's resolution. Apart from that, in order for the actor to move beyond the edge and for scrolling to start, you have to extend your floor region to the whole scene. Furthermore, you can force the scene to scroll by using Scene.ScrollTo() or Scene.SkipTo(). For reference to the possible commands for each entity type, I suggest that you go to http://docs.dead-code.org/ and go to Scripting in WME -> Script language reference and always have it available for reference. I use the online documentation because I can use the Chrome's search functionality to quickly find what I want. For Step 4 It seems you have the right idea here. Some testing will help you with the timings i.e. how much you Sleep(). For new actors you can use Scene.LoadActor(). This will create actors that will appear only in this scene. From what I see, actor and sally must have been loaded in game.script, using the command Game.LoadActor() which creates actor visible in every scene. Great insights/pieces of advice! THANK YOU for such detailed recommendations. I needed the actor to stop, actor 3 (let's call him "guy") makes a simple animation, says his words and then the scene scrolls sidewards on its own, as if camera was moving to the right without the actor walking there. Scrolls the scene to the given point / object. The Scene.AutoScroll attribute must be set to true for this method to work. ScrollTo method blocks the script execution until the scrolling is over, while the ScrollToAsync method returns immediately. I don't quite understand what the code could look like Can you please share your ideas on this method? Step 7 is all about this scroll. Should I use actor 4 as Object parameter? Is that possible? Maybe guy.Talk triggers this scrolling? 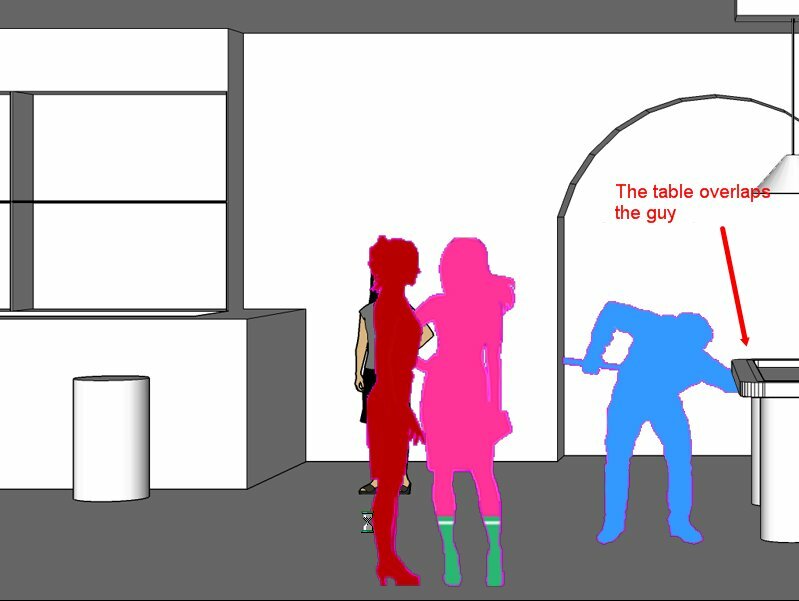 //4 seconds before Guy's animation, so that actor and Sally had enough time to get there. //Guy makes his simple movement, waits for 2 seconds and asks a question. PlayAnim worked like magic! Brilliant idea of yours, anarchist. Earlier in the code, right after loading actor and sally, I loaded guy (actor 3). Have I done it correctly? I have a problem with guy and billiard table, though. The table is an entity on a separate layer and it has parallax effect. In the screen below you can see it overlaps guy. I see the guy sprite must be a bit bigger, but it would be better if the cue was over the table, not behind it, lol) I don't know how to make this either. Honestly, without your help I wouldn't have managed a thing. Furthermore, you can force the scene to scroll by using Scene.ScrollTo() or Scene.SkipTo(). Scene.AutoScroll = true; //The scene can scroll automatically. Scene.SkipTo(husband); //Scroll the scene to husband. The reason for Scene.SkipTo() is that Scene.ScrollTo() does not work at all. With Scene.ScrollTo() everything freezes without any change. However, Scene.SkipTo causes view to jump to "husband" and then slowly scrolls to the left till we see three previous actors again While it is supposed to be vice versa: from those three actors the view should slowly scroll to "husband". Please help me to solve this. And a question from my previous post about the "table" entity overlapping "guy" actor is still open. I haven't used scrolling in my scenes so I will try to help you a bit blindly. So it can be set to null. Perhaps this would work? As I said above, I am working blindly, but from what I read in the documentation, the behaviour you observe does make sense, so I think this will work. Yes, anarchist, the code that you came up with works perfectly! The whole scene now scrolls to "husband" actor smoothly. Do you happen to know if it is possible to speed up scrolling speed? Or it is not a changeable feature? You were helping me *blindly*, without any use of scrolling in your project, wow! I am so impressed and sooo grateful to you! THANK YOU, anarchist! You and NAItReIN are my heroes. Without you, guys, I don't know how I'd even crack all this scripting. Guess this is the pure question of experience. I don't have any special talents, I simply have been working as a professional programmer for years (and on Wintermute for some years too), which among other things gives you the ability to find solution to your problems through searching (either the documentation or the Internet in general). As you said, it is a matter of experience. You can play with these to get what you want. What goes around comes around. This forum helped me a lot in my game, so I am simply returning the kindness I received. Kindness breeds kindness, I am sure you will do the same some day. 19:10: Call to undefined method 'ScrollSpeedX'. Ignored. 71. Scene.AutoScroll = true; //The scene can scroll automatically. 72. Scene.ScrollSpeedX = true; //The scene can scroll horizontally. 73. Scene.ScrollSpeedX(20); //Set scrolling speed to 20 ms.
74. Scene.ScrollTo(husband); //Scroll the scene to husband. You are right, anarchist. I just hope that some day I'll be experienced enough to help someone on this forum just like you do. Scene.ScrollSpeedX = true; //You assign a boolean value instead of an integer. Scene.ScrollSpeedX = 20; //Default is 10, so this will make the scene scroll faster. Once I corrected scene_init.script with your piece of code, the scene started playing without any errors! Yay! The funny thing is I used to think setting Scene.ScrollSpeedX to 20 instead of the default 10 will speed up scrolling)) While it's vice versa - reduction of the integer makes the scene scroll faster. I set the attribute's value to 2. The "cut-scene" as scripted sequence looks exactly like I wanted it to be, anarchist! THANK YOU!!! Wish I could help other beginners like you do some day. What if we offer scene auto-scrolling as a tutorial for WME Knowledge base? I think this feature is quite frequent for adventure games. What do you think? What if we offer scene auto-scrolling as a tutorial for WME Knowledge base? I think this feature is quite frequent for adventure games. What do you think? That sounds like a wonderful idea! I am afraid you will have to do it on your own though since I don't have enough time to contribute. Hey anarchist! The tutorial based on your advice is now available in "How-to" articles in Knowledge Base. You can find it here http://res.dead-code.org/doku.php/kbase:how_to_make_scene_auto-scrolling_in_wintermute_engine. Please kindly view it and tell me if something is incorrect or vague (I want beginners like me get a clear guide).